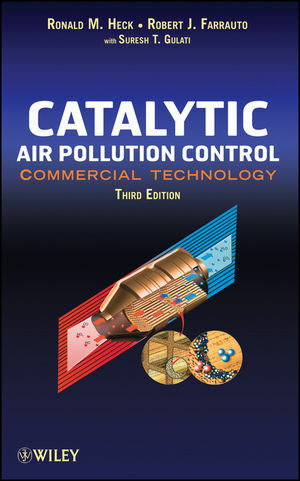 Catalytic Air Pollution Control: Commercial Technology is the primary source for commercial catalytic air pollution control technology, offering engineers a comprehensive account of all modern catalytic technology. This Third Edition covers all the new advances in technology in automotive catalyst control technology, diesel engine catalyst control technology, small engine catalyst control technology, and alternate sustainable fuels for auto and diesel. Ronald M. Heck, PHD, is President of RMH Consulting, where he specializes in consultation on environmental catalysis for auto, diesel, and stationary sources; general catalysis; fuel cells; reaction engineering; combustion technology; and chemical engineering. Previously, Dr. Heck was a Research Manager responsible for developing new catalyst technology for Engelhard Corporation's worldwide customers in environmental catalysis. Robert J. Farrauto, PHD, is a Research Fellow at BASF Catalysts and Adjunct Professor in the Earth and Environmental Engineering Department of Columbia University in the City of New York, where he teaches courses in catalysis and supervises graduate student research. His responsibilities at BASF Catalysts include the development of advanced catalysts for the hydrogen economy. He has worked extensively in the development of catalysts for the environmental, petroleum, and chemical industries. Suresh T. Gulati, PHD, is a Consultant to the Science and Technology Division of Corning. He has also been a research fellow with Corning, specializing in the behavior of brittle materials. Dr. Gulati has many years of experience working with automotive substrates, with an emphasis on their design and durability for diesel and passenger car applications. 1.2 Catalyzed Verses Non-Catalyzed Reactions. 1.5 Promoters and their Effect on Activity and Selectivity. 1.6 Dispersed Model for Catalytic Component on Carrier: Pt on Al2O3. 1.7 Chemical and Physical Steps in Heterogeneous Catalysis. 1.8 Practical Significance of knowing the Rate-Limiting Step. 2. The Preparation of Catalytic Materials: Carriers, Active Components, and Monolithic Substrates. 2.3 Making the Finished Catalyst. 2.4 Nomenclature for Dispersed Catalysts. 2.5 Monolithic Materials as Catalyst Substrates. 2.9 Precious Metal Recovery from Monolithic Catalysts. 3.2 Physical Properties of Catalysts. 3.3 Chemical and Physical Morphology Structures of Catalytic Materials . 3.4 Techniques for Fundamental Studies. 4. Monolithic Reactors for Environmental Catalysis. 4.3 The Arrhenius Equation and Reaction Parameters. 4.5 Reactor Bed Pressure Drop. 5.5 General Comments on Deactivation Diagnostics in Monolithic Catalysts for Environmental Applications. 6.2 The Catalytic Reactions for Pollution Abatement. 6.3 The Physical Structure of the Catalytic Converter. 6.4 First-Generation Converters: Oxidation Catalyst (1976-1979). 6.5 NOx, CO and HC Reduction: The Second Generation: The Three Way Catalyst (1979 - 1986). 6.6 Vehicle Test Procedures (U.S., European and Japanese). 6.7 NOx, CO and HC Reduction: The Third Generation (1986 - 1992). 6.8 Palladium TWC Catalyst: The Fourth Generation (Mid-1990s). 6.9 Low Emission Catalyst Technologies. 6.10 Modern TWC Technologies for the 2000s. 6.11 Towards a Zero-Emission Stoichiometric Spark-Ignit Vehicle. 6.13 Lean-Burn Spark-Ignited Gasoline Engines. 7.1 Introduction to Ceramic Substrates. 7.3 Design Sizing of Substrates. 7.4 Physical Properties of Substrates. 8.2 Worldwide Diesel Emission Standards. 8.4 Analytical Procedures for Particulates. 8.7 2007 Commercial System Designs (PM Removal Only). 8.8 2010 Commercial System Approaches under Development (PM and NOx Removal). 9. Diesel Catalyst Supports and Particulate Filters. 9.2 Health Effects of Diesel Particulate Emissions. 9.3 Diesel Oxidation Catalyst Supports. 9.4 Design/Sizing of Diesel Particulate Filter. 9.6 Physical Properties and Durability. 9.7 Advances in Diesel Filters. 10. Ozone Abatement within Jet Aircraft. 10.4 Analysis of In-Flight Samples. 11.8 Regeneration of Deactivated Catalysts. 12.2 Nonselective Catalytic Reduction of NOx. 12.3 Selective Catalytic Reduction of NOx. 12.6 Catalytically Supported Thermal Combustion. 13. Carbon Monoxide and Hydrocarbon Abatement from Gas Turbines. 13.2 Catalyst for CO Abatement. 13.3 Non-Methane Hydrocarbon (NMHC) Removal. 13.4 Oxidation of Reactive Hydrocarbons. 13.5 Oxidation of Unreactive Light Paraffins. 14.4 Catalyst for Handheld and Nonhandheld Engines. IV. NEW AND EMERGING TECHNOLOGIES. 16. Fuel Cells and Hydrogen Generation. 16.2 Low-Temperature PEM Fuel Cell Technology. 16.3 The Ideal Hydrogen Economy. 16.5 Hydrogen Generation from Natural Gas for PEM Fuel Cells. 16.6 Other Fuel Cell Systems.